Higher Education, Higher Incomes…Opportunity for all? Having a college degree can dramatically increase a young adult’s income. According to the National Center for Education Statistics, in 2014 the median earnings of young adults (ages 25-34) with a bachelor’s degree were 66 percent higher ($49,900) than the median earnings of young adults with only high school diplomas ($30,000). Anyone who performs well in high school can apply to college, and there are many scholarships, financial aid, and other support programs available to help make college an option for everyone. But does this help? Topic 4 in Fair Game? asked users to think about whether household income is related to the likelihood of getting a college degree and what that relationship should look like in a fair world. 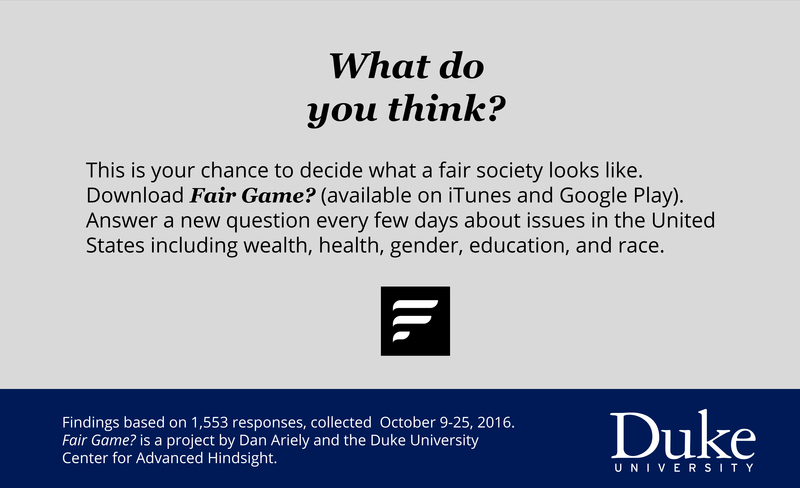 How much more likely do people think the wealthy should be to get a college degree, in a fair world? 4x more likely. Estimates for the greater likelihood of getting a college degree were remarkably similar across all age groups, as were our users’ beliefs about what would be fair. There may be hints of a difference in what people think is fair, with 30-50 year-olds reporting 4x likelihood, while other age groups said a 5x likelihood would be fair. One possible explanation for this difference is that people in the 30-50 age range may be actively planning or paying for their children’s college expenses. What about gender? Males and females differ in their estimates of the greater likelihood of getting a college degree for the top 25% of income, estimating 12 and 14 times greater likelihoods, respectively. But they agree in what they think a fair likelihood would be — 4x. And political leaning? People who identify as conservative and those who identify as liberal estimate the same (13x) greater likelihood of getting a college degree for the wealthy. In terms of how much more likely the top 25% of income should be to get a degree, in a fair society, conservatives answered 6x more likely and liberals answered 3x more likely. So although their understanding of the world is similar, their notions of fairness, for this topic, are very different. Together, the data reported here suggest that people overestimate the gap in the likelihood of getting a college degree. And they would reduce the size of the gap that they perceive. There are many factors that contribute to the gaps in attainment of a college degree. Family income based factors are certainly an important contributor. But there are also decisions about whether to apply to college at all, what type of college to attend (e.g. for profit vs. nonprofit), how to access and pay back loans, and what kind of support a student may have from their social networks. Sometimes, just the paperwork involved in applying to college can overburden a prospective student and derail the process. It is encouraging then that low-cost interventions have the potential to improve college opportunities for low-income students. Given the potential economic benefits that would result from more low-income students getting a degree, what are other possibilities that might work to increase the proportion who ultimately do get a degree?